Kicking Set 1 is the required set for orange belt in Ed Parker’s American Kenpo. In our Yellow Belt Set & Form we learned how to defend and how to defend while retreating. In Orange Belt our form reinforced what we learned in Yellow Belt by having us perform Short Form 1 on both sides. Here in Kicking Set 1 we break, for a bit, from the retreat and block mentality to instead move forward and strike. This entire set is advancing forward with kicks delivered in a variety of ways. Kicking Set 1 will help develop balance and coordination as you learn to deploy 4 kicks 13 different ways. To maintain a constant guard while moving and kicking. To use a cat stance to change directions. To use different methods of executing the same kicks. Execute a right step through ball kick toward 12:00, planting your right foot forward into a right neutral bow facing 12:00. Execute a left front crossover and a right knife edge kick toward 12:00, planting your right foot forward into a right neutral bow facing 12:00. Shuffle forward with a right front roundhouse kick toward 12:00, planting your right foot forward into a right neutral bow facing 12:00. Slide your right foot back toward 9:00 to form a left neutral bow stance facing 3:00. Deliver a right step-through knife edge kick toward 3:00, planting your right foot forward into a right neutral bow stance facing 3:00. Shuffle forward with a right snapping ball kick toward 3:00, planting your right foot forward into a right neutral bow stance facing 3:00. Shuffle forward with a right front roundhouse kick toward 3:00, planting your right foot forward into a right neutral bow stance facing 3:00. Shuffle forward with a right rear kick toward 3:00, planting your right foot toward into a right neutral bow stance facing 3:00. Step toward 12:00 with your left foot and pivot clockwise to form a right neutral bow stance facing 6:00. Execute a left spinning rear kick toward 6:00, planting your left foot forward into a left neutral bow stance facing 6:00. Shuffle forward with a left front roundhouse kick toward 6:00, planting your left foot forward into a left neutral bow stance facing 6:00. Shuffle forward with a left front snapping ball kick toward 6:00, planting your left foot forward into a left neutral bow stance facing 6:00. Shuffle forward with a left knife edge kick toward 6:00, planting your left foot forward into a left neutral bow stance facing 6:00. Execute a right step through ball kick toward 9:00, planting your right foot forward into a right neutral bow stance facing 9:00. Execute a left step through roundhouse kick toward 9:00, planting your left foot forward into a left neutral bow stance facing 9:00. Execute a right spinning rear kick, planting your right foot forward into a right neutral bow stance facing 9:00. Execute a left snapping knife edge kick planting your left foot forward into a left neutral bow stance facing 9:00. 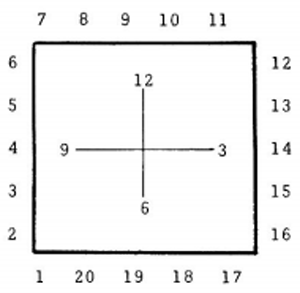 Pivot clockwise to face 12:00 in a horse stance.